The Advent wreath is the traditional centerpiece of the Christmas season. It symbolizes the passage of the four weeks of Advent in the liturgical calendar of the Western Church.Advent begins on the fourth Sunday before Christmas Day. On the First Sunday of Advent, a purple (or blue) candle is lit to celebrate Hope, the inspiring and uplifting hope that Christ among us represents. On the Second Sunday of Advent, another purple (or blue) candle is lit to celebrate Peace, both the Prince of Peace himself and the promise of peace on Earth. 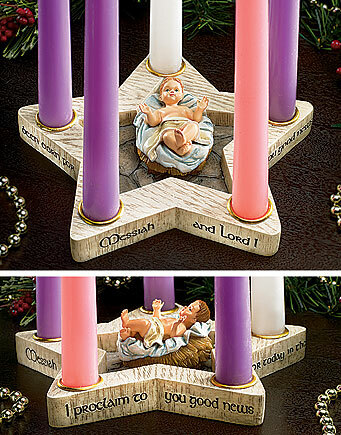 On the Third Sunday of Advent, a pink candle is lit to celebrate Joy, the joy the shepherds received at hearing the news of Christ's birth, or the joy that God brings into our lives. As the coming of Christ draws near, the final purple (or blue) candle is lit on the Fourth Sunday of Advent to celebrate Love, both God's boundless love for us and our love for one another. Some Advent wreaths include a fifth, "Christ" candle which can be lit at Christmas to celebrate the purity of Jesus and the joy felt on this day.The bright light from the candles is an expression of the growing anticipation of the birth of Jesus Christ, who in Christian faith is seen as the Light of the World. The circular shape of the wreath represents God's eternity and unity. Our Advent wreath is the perfect centerpiece for any home. Holds (5) candles. Advent candles set sold separately (#82667).